Independence Fugitives from Catalonia being rounded up ready for a show trial. As usual, world headlines are full of tales of woe, from Russian poisoning to Donald’s love affairs. Brexit never stops hitting the UK media whilst North Korea’s young dart thrower has crossed his own red line and met with the Chinese to anchor down the nuclear hot air balloon. There has obviously been a great deal more that would dwarf any Google News page yet as far as Europe is concerned the one item that has surfaced yet again is Catalonia’s continued attempt to seek independence from the rest of Spain. But this time round my repetitive reporting over the years takes on a new script. Over the past few months the movements of the actors, for use of a better word are straight out of a chapter of the 1993 Oscar winning film ‘The Fugitive’ featuring Harrison Ford and Tommy Lee Jones. The ex-Regional President Sr. Carles Puidgemont and many of his separatist party comrades and followers have been on the run around Europe, whilst those that have remained have either been arrested or are on the verge of, should they step out of line and hit the ‘leave’ button. Ever since the Spanish government imposed article 155 of the Constitution, literally taking over the rebellious autonomy the legal system kicked into place, the Spanish judges began to have a field day and, similar to Claude Reins in ‘Casablanca’ have been ‘rounding up the usual suspects’. By no means is this particular report implying that the situation is being taken likely and that the carry-on of the protagonists in question are all part of a comedy act. No way! The present situation has become more serious than ever because for the first time other countries in Europe have been brought into the political dilemma as possible supporters or hinderers. Starting with Belgium, that has its own separatist movements, to the North, into Finland where Sr. Puigdemont eventually started his fugitive escapade a few weeks ago. So how has all this James Bond style chase ended? Puigdemont travelled to Helsinki to gain further support for the independence cause by giving yet another one of his lectures. Once he had left his Brussels bunker, the Central Intelligence Agency in Spain - equivalent to the CIA - with the help of Interpol, put a tail on him and began to trace his return journey. Travelling by car, he caught the overnight Helsinki/Stockholm ferry, drove across Sweden and hence on to Denmark. The secret service lot had placed a device in the car and were tracking his moves all the way to the Danish/German border. Once he crossed over into Ms. Merkel’s domain he was immediately arrested and taken to the small town of Neumunster where he has been imprisoned awaiting trial and possible extradition back to Spain to face the music. The judicial paperwork had already been handed to the German authorities by Interpol. The above is the actual situation as it stands at the moment. There are many other ramifications involving arrests as well as other extradition orders for the remaining fugitives. The Spanish government has not moved an inch, and is backed by the constitutional parties - the Socialists and Ciudadans - which continues to apply the law that considers the present Catalan government illegal in its pursuit of independence. Regardless of the support from Germany's judges, to return Puigdemont to Spain to be tried for 'treason', thus backing constitutional Spain, the separatist 'feeling' amongst a large sector of Catalans is still deep rooted and will not change. The danger is now centred on serious violence spreading across the region by the so called independence radicals from the various party political 'usual suspects'. Hate to say it, but all it needs is a high voltage assassination and we really are back to 1936. Don't forget that the Podemos lot, 4th in the poles, continue their pledge to cause a rumpus revolution, Venezuela style. The mayors of both Madrid and Barcelona are in their hands. Here endith the official situation. Now the repercussions. New demonstrations and street violence was obvious, not only in Catalonia but in dozens of capitals around the world by both Catalans and sympathizers of their independence movement. 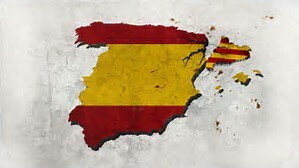 Once again the affair hit the international media headlines, especially the European and most were either condemning Spain or on a milder tone suggesting that both parties should try to iron out their differences even if it meant bowing to a Scottish-style referendum. However, most of the European governments have backed the Spanish government’s approach because they recognize Spain’s ‘rule of law’ that is being applied and deny the rhetoric by some media accusing the country of a new type of fascism similar to Nazism in Germany during the 1930’s. In fact, a survey in ‘The Economist’ placed Spain in the top 20 democratic counties of the world with one of the greatest in terms of freedom. Nevertheless, the seeds of discontent continue and if a referendum were to be allowed the first move would be to open up the present 1978 Constitution that would obviously have to be revised beforehand. It could take years! Again it would trigger other regions waiting in the wings to follow suit, such as the Basque Country, Galicia, Valencia and the Balearic Islands and demand their own independence. A Balkan situation could be inevitable with possible violent repercussions. One only has to look back at the II Republic period between 1931 and 1936 when Catalonia had declared independence (in 1934) for the first time. Two years later, the infamous three-year Civil War was started. I’ll leave it there as the situation is dynamic, volatile and continues to change like the color of an octopus. So what else is happening in Spain? Nothing much. Apart from the continuing positive economic figures, municipal elections are up soon, kicking off the usual campaign slogans, corruption is still around but to a lesser extent, holiday season is upon us, starting with the Easter parades and an increase in tourists flocking to the beaches adding more lolly to the government’s coffers. And finally the dramatic drought followed one of the severest winters in recent history seems to be over as rain is now pouring down filling up all the empty reservoirs. But then hasn’t Europe and the rest of the world been subjected to a similar climatic ordeal? © James G. Skinner. April 2018.